For the last few years I’ve made an Easter cake to raffle off for charity at work. I offered to do the same again this year for the charity of the month – Hearing Dogs. Being at work all week meant I only had a couple of evenings to make and decorate it so I picked something fairly simple. The cake was a chocolate caramel ombré cake and I crumbled up the off cuts of the chocolate cake to make the soil. I covered the whole cake in green sugarpaste, cut out a circle from the middle and then filled it with the ‘soil’. The bunny was made from a ball of white icing flattened slightly and then put in the soil. I then stuck on a small ball of icing for his tail and made 2 feet which I finished off with a few small circles of pale pink icing. The carrots were made from orange icing and I marked some lines on them with the back of a knife. I added cake wire to the middle of the green carrot tops to keep them standing upright. Annoyingly they were slightly too tall to fit in the box so I had to break the tops off to make them a bit shorter! Hope you all enjoy the long Easter weekend! Last year a friend at work asked if I’d be able to make a birthday cake for one of her friends. 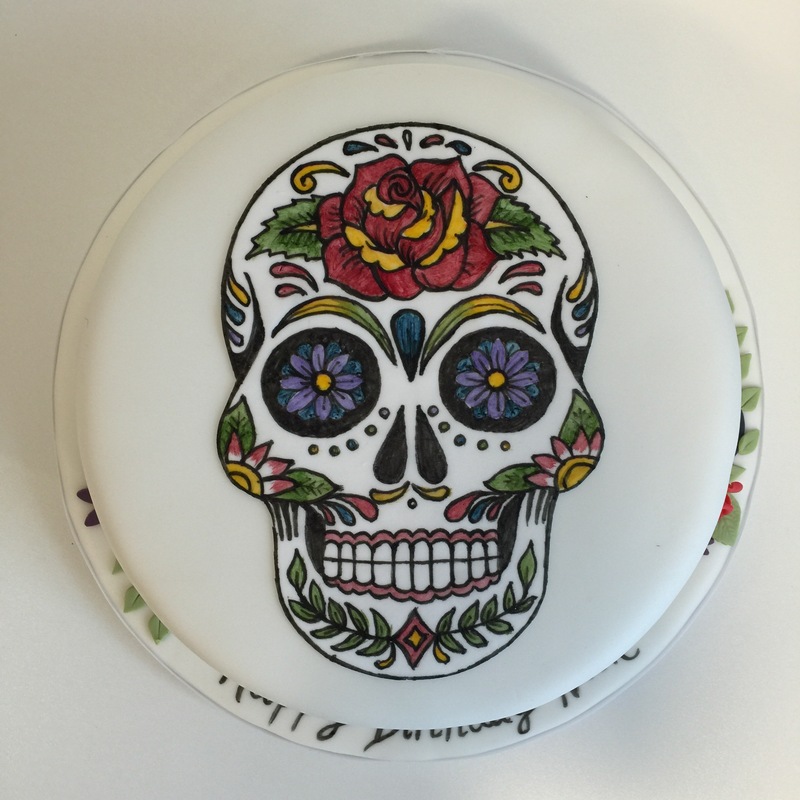 However when she said she wanted a sugar skull on it, I had no idea what she was on about and was worried that if agreed to make something I wouldn’t be able to do! Click here to find out how I made it.